The Oakland County branch of the FBI has filed an arrest warrant for three suspects involved in several bank robberies and possession of stolen guns. 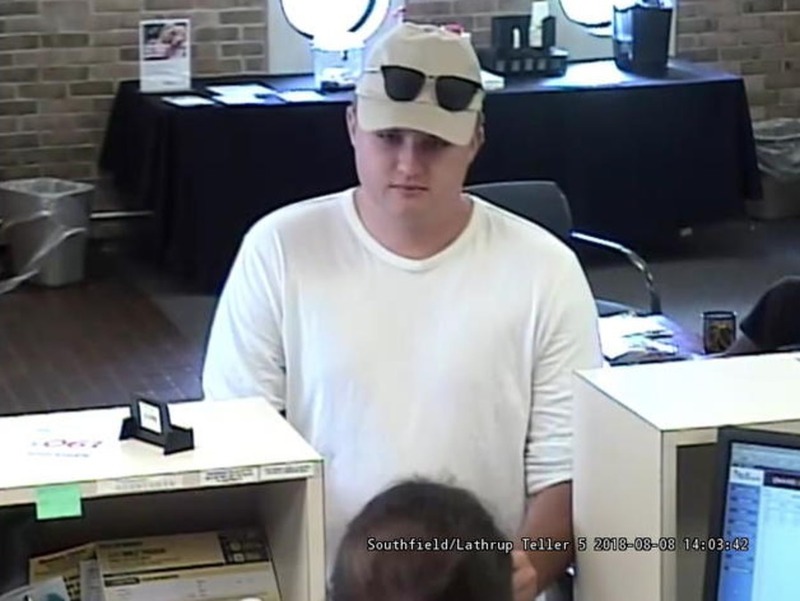 According to FBI special agents, Jeffrey Ethan Able is allegedly behind a July 6 gun store robbery, a July 13 7-Eleven robbery, a July 16 Mobile gas station robbery, a July 23 Alliance Catholic Credit Union robbery and an August 8 TCF Bank robbery in Oakland County. On July 6, 2018 around midnight, police say an unknown subject broke into the Wicked Trigger Farms store on Dixie Highway in Waterford. The suspect allegedly stole 13 hand guns and two long guns. When officials reviewed the store's surveillance footage, they saw one suspect "wearing a zip up hoodie with a light colored half face mask and light colored gloves." The suspect broke in through the back door using a pry bar, put all of the stolen firearms into a backpack and left the store around 12:44 a.m., officers say. Waterford Police later found two of the stolen guns in the bushes behind Wicked Trigger Firearms store. On July 13, 2018 around 12:14 a.m., an armed suspect robbed a 7-Eleven on Scott Lake Road in Waterford, stealing about $100. According to the store clerk, the suspect pointed a black semi-automatic pistol at him and demanded to opened the register. As the suspect left the 7-Eleven, he reportedly to the clerk to "have a good night." Surveillance video again showed the suspect "wearing a green hooded zip up hoodie, dark pants, white gloves and a white half faced mask." The suspect struck again at a Mobile gas station in Highland Township on July 16. Around 1:16 a.m. Police say he demanded cash from the clerk pointing a black handgun during the robbery. He allegedly made off with $310. Officials reviewed surveillance, which showed the subject wearing the same dark hoodie and white half face mask from the two previous robberies. On July 23 in the afternoon, the same suspect robbed the Alliance Catholic Credit Union branch located on Main Street in Rochester. This time he handed the teller a note demanding money and say he was armed. The teller complied, put $2,539 in an envelope, and the man left the scene. Police say the suspect was described as a white male, wearing a red hat, sunglasses, grey hoodie, jeans and black shoes. On August 8 around 2:00 p.m., the TCF Bank branch located on West 12 Mile Road in Lathrup Village. This time surveillance video captured the suspect's face on camera. He was seen wearing a white hat, white T-shirt and sunglasses. According to police, the suspect made off with $2,400. After continued investigation, the Oakland County Fugitive Apprehension Team was able to locate and arrest Able on probable cause. Officers found a black iPhone on Able when he was arrested August 14. Investigators obtained a search warrant for the phone and recovered incriminating deleted images and videos related to the robberies. A photo of handguns in Able's lap was dated July 6 -- the same date as the firearm store robbery. Another allegedly showed a person wearing a partial mask and dark hoodie entering through a pried door and showing the inside of what looked like the Wicked Trigger store. Police also recovered Able's text messages to Hunter Hammond. Able asks "have you sold any merch." More deleted messages show on July 13 via the Kik application, show the suspect telling another user how allegedly ended a robbery by telling the teller to "have a good night." Upon further investigation, police found nine of the stolen handguns in the backyard of a Parker Cavanaugh. Authorities say they have probable cause to seek warrants for Hunter Hammond and Parker Cavanaugh. Anyone with information about the suspects should contact the local FBI office at (248) 879-6090.